Nokia is a famous brand of Mobiles in all over world. This is most trusted and has a largest number of customers, especially in India. Nokia is known for its good quality of mobiles. There are so many mobile models of Nokia. Nokia C3-01 is one of them. It is a latest model introduced by Nokia. It has the largest number of featured mobile phone at cheaper price. It is the complete solution of Multimedia. 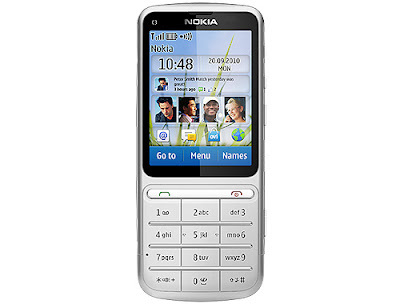 Nokia C3-01 is released on 17th November 2010 in Mumbai, India. It has the combine features of touch Screen and Keypad. Touch and Type is another name of this phone, because of this feature. It has a wide screen of 2.4 inch with resistive touch screen and the screen resolutions of 240 X 320 pixels with 262000 colors. It has also a regular keypad of alphanumeric for easy and fast typing. It is the sixth edition of Series 40. It supports the GSM, HSPA, quad band WCDMA and WLAN. It has a 5 MP camera with LED Flash light for the best quality of images and videos. The dimension of this mobile phone is 111 x 47.5 x 11 mm and its weight is only 100gms. It has a 100% stainless steel metallic body. It can be connected through Via Bluetooth, high speed 2.0 USB port, WLAN WI-FI with the Frequency of 802.11b/g/n, HTML, 2.0 WAP xHTML browsers for internet. The 3G high speed internet technology feature is also available in this phone. You can get the fastest speed of 10.2 Mbps in HSDPA for downloading, Browsing and uploading by the help of 3G. It has an internal memory of 30 MB and also the expandability up to 32 GB with the micro SD card. It can support the various website of social networking like Twitter, Face book and etc. you can be stay connected with your social friends. It has also an advanced MP3 player, which can support the various files format. There are three amazing colors of this mobile phone is available in the market like Khaki, Gold and Silver. You can send SMS, MMS and also email from this phone by the help internet. It has a standard BL-5CT Li-ion Battery of 1050mAh. You can get the stand by up to 400 hours and talk time up to 6 hours in 2G, 440 hours stand by and talk time up to 4 hours in 3G and also the 20 hours back up in Music play. The cost price of Nokia C3-01 is around Rs. 10000 in India. Mobile Price In Pakistan : "Brand" Mobile Phones Prices in Pakistan (Karachi, Lahore, Islamabad & KPK) - "Brand" Price Comparison and complete Specifications of new smart phones.